Navaratri is one of my most favorite Hindu festival. This year, Navaratri will be celebrated from 13th October to 21st October. So what is Navaratri really? It, arguably, is the longest religious worship through rhythmic movements. It is the festival of nine nights when, through dance, the Goddess (the Female aspect of Divinity) is worshipped. Most people seem to have forgotten that it is not just a dance; it is a form of worship. In Gujarat, it is also called ‘Garba’. Garba comes from the word Garbha which literally means the womb. This festival is the celebration of the Shakti (The Primordial Power), the female aspect of creation that gives birth to the entire universe and sustains it. Garba is performed in circles. The reasoning behind this is that the circle is a representative of the on-going, continuous cycle of birth and death. 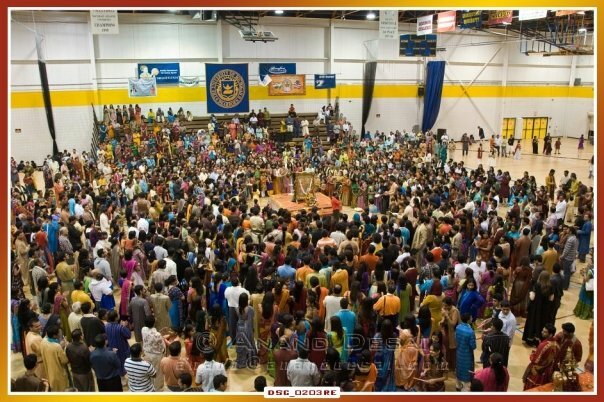 Just like the participants in the garba enter and leave the circle, in the same way people come and go in the circle of life. Irrespective of this, the circle continues. The more I try to understand why we (Hindus) do what we do – be it any form of worship ritual, chanting, meditation – the more I realize how much we seem to have distanced ourselves from the true essence of worship. These days the value of garba during Navaratri appears to be reduced to wearing fancy folk attire and dancing to tunes that are not even devotional songs. It really pains me to hear the singer suddenly switch from singing a song in praise of Devi to singing ‘Pari hoon main.’ For real? Like really? Now don’t get me wrong. I love Bollywood music. Just ask people who know me. But there’s a time and a place for it. Here’s the thing, though. One of the best aspects of practicing Hindu worship rituals is its uniqueness. I struggle with trying to understand why do we have to ‘compromise’ our way of worship to essentially make it more appealing to others? Whoever these others are. The irony here is that most people who are not familiar with Navaratri are more than willing to learn about it. Everyone is welcome to join garba, provided they fully understand what they are really participating in. It’s only fair. Year after year, I go for garba. I get frustrated. I come home and vent to all those who will listen. The following year, I go back again. With almost every step I take during garba, I remind myself of what it really is all about. The moments are filled with awe and sincere devotion to That which is, which always will be. Wishing everyone that celebrates this festival season, a very Shubh and Auspicious Navaratri. May Maa Ambe surround you all in Her Unconditional Love. A Very Shubh Ganesh Chaturthi, everyone! May your days be filled with unobstructed life situations and full of sheer bliss and peace. O Lord Ganesha, of Curved Trunk, Large Body, and with the Brilliance of a Million Suns, Please Make All my Works Free of Obstacles, Always. Mentioned above is the Ganesh Mantra. Invoking the presence and blessings of Lord Ganesha is the first step of any rites, rituals, puja (worship). A lot of devotees also begin their daily tasks in the same manner. Personally, I recite this mantra during my morning worship as well as when I step out of the house for the day. As the English translation explains: Asking for all my tasks to be free of obstacles by Lord Ganesha’s grace. It is extremely important to note that every Hindu deity is symbolic and that devotees understand that images are pointers to the Supreme Reality that pervades everything that exists. Lord Ganesh is a representation of one who has realized the Ultimate Reality. Lord Ganesh encourages seekers to aspire for and reach the Supreme State through proper spiritual practices. The large ears and elephant head of Lord Ganesh represent wisdom through sravana – active listening – to the eternal truths of Vedanta and manana – independent reflection upon those truths. This works as daily reminders for me as I put on the badge of a chaplain when I enter the hospital. As chaplains, the very thing we are taught is to listen to the patients, to really hear what they are telling us. Following that, we are encouraged to reflect in an independent, unbiased manner upon what transpired within the patient room and figure out any lessons learned. So the manifestation of Ganeshji reminds me every morning what I am to aspire for : Active listening and independent reflection. May your days be filled sheer bliss.